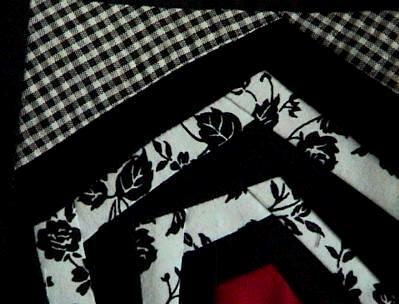 This is a pretty little birdhouse black and white roses mini wall quilt top that I made. ALL foundation papers have been removed from the back. The "yard" is a black and white check fabric. The sky has matching fabric. You can add a border and make wider if desired. It is made with mostly cotton fabrics. The prewashed red is a cotton/poly fabric.